Nokia's president Stephen Elop took to the stage this afternoon at the hotly-anticipated Nokia press conference at CES. As many predicted, Nokia introduced the Nokia Lumia 900, an LTE 4G Windows Phone for AT&T. Like the Lumia 800, the Lumia 900 uses the ClearBlack Super AMOLED technology. When I got my hands on with the Lumia 800, I noted that the display had great viewing angles, bold colors, and sharp text. Blacks look deeper and glare is reduced. It does really well in bright sunlight as well. 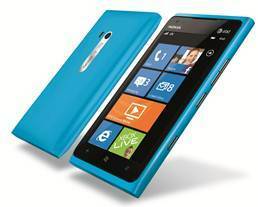 The Lumia has a larger display, however, at 4.3 inches as opposed to the 3.7-inch Lumia 800. The Lumia 900 has the same single injectable polyurethane matte plastic build as the Lumia 800, which gives it a sturdy feel. The material is soft to touch, but scratch and fingerprint resistant. It also doesn't feel like it will completely shatter if you drop it. The Lumia 900 will come in cyan (sort of a bluish green) or black. And, trademark to Nokia flagship phones, the camera in the Lumia 900 has a Carl Zeiss lens with a F2.2 aperture. The Lumia 900 has a dual wide mode function allowing you to take wide angle shots. When I tested the Lumia 800's camera, I was impressed with the snappy shutter speed and high quality photos. I'm happy to see that the Lumia 900 has a front-facing camera--something the Lumia 800 was sorely missing. The front-facing camera is also wide-angle, which is useful for video conferencing with multiple people. Of course, the Lumia is a Windows Phone and comes with a few included apps like Tango for video chat, ESPN, CNN and Nokia Drive (Nokia’s navigation app). The ESPN and CNN apps subscribe to Windows Phone's "metro style" with sliding panels and big bold text. The Nokia Lumia 710, which we reviewed last week is coming to T-Mobile on January 11. The Nokia Lumia 900 will arrive at AT&T in the coming months. Pricing has not been announced.